​Wherever you see our food truck, you know there is great paella and fun involved. 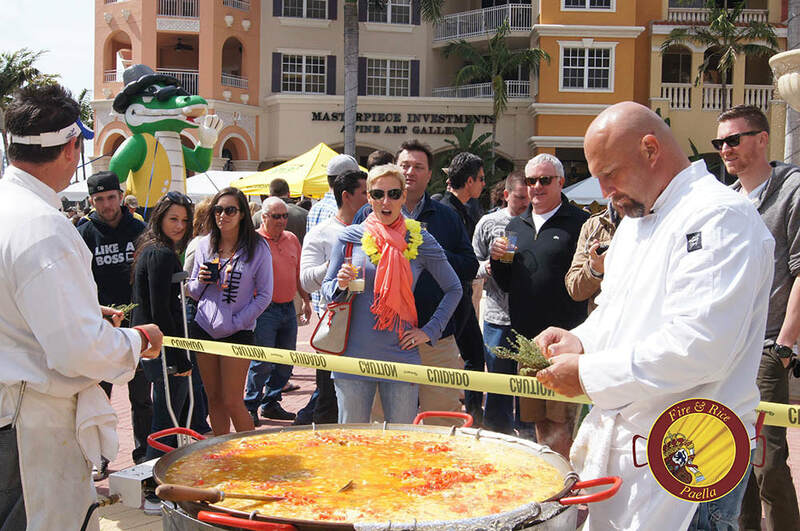 Whether you visit us at the farmers’ markets in Naples and Marco Island or see us at a catered event or festival, you’ll enjoy magnificent paella in a communal dining experience that you’ve never encountered before. ​Come Down to the Naples Farmers’ Markets & Join in the Fun! It’s farmers’ market season, and we couldn’t be more excited! 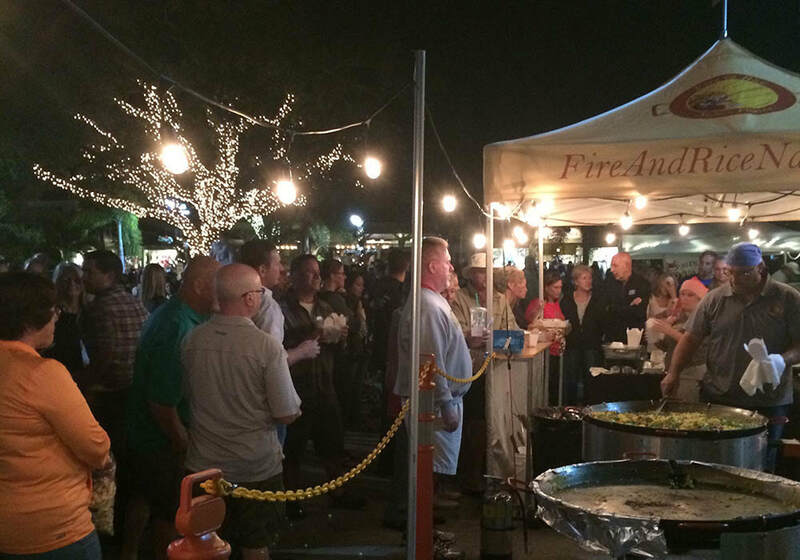 The farmers’ markets in the Naples and Marco island area are a local tradition, and the Fire & Rice food truck has been a big part of those events for many years. At Fire & Rice, we love creating our delicious paella and bringing people together to enjoy this magnificent dish. We hope you’ll come down and join the experience. Customers line up early to get the first batch of our delicious paella and be part of the excitement. Watching us prepare the paella and sharing in the communal dining experience is all part of the fun. Made with only the finest ingredients and enthusiasm, our paella is magnificent, like nothing you’ve tasted before. In fact, many of our clients have traveled all over the world and say it’s the best paella they’ve ever had. 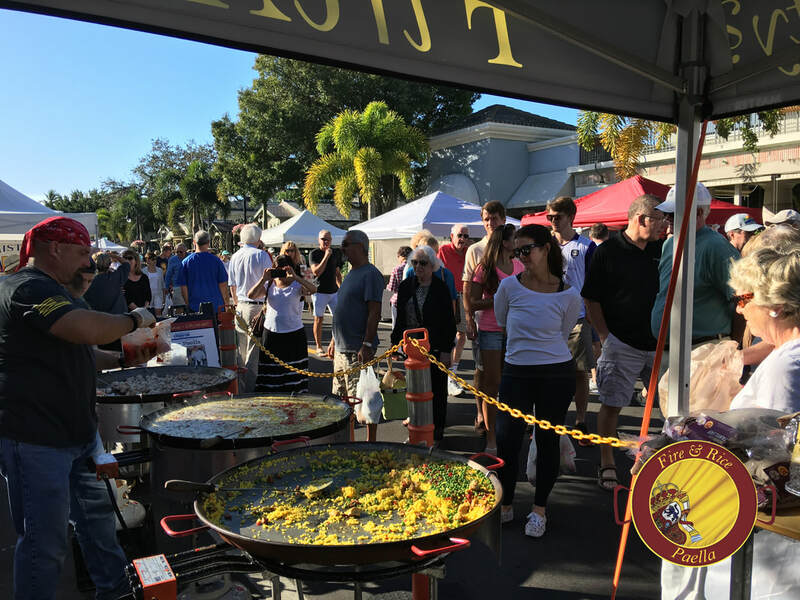 Visit us at the Third Street Farmers’ Market on Saturdays and the Marco Island Farmers’ Market on Wednesdays to see what the paella experience is all about. If you can’t make it early, don’t worry: Now you can pre-order our delicious paella, and we’ll put some aside for you before we run out. At Fire & Rice, we offer a unique and exciting alternative for your next catered event. Our chefs prepare magnificent paella out for everyone to see, so guests are part of the process from the moment they arrive. It’s spectacular to watch, and the paella is extraordinary. When your guests taste our paella, they will be truly amazed. The unique flavors of meat or seafood, or a combination of both, fuse together with Bomba rice and delight in the delicate floral flavor of saffron imported from Spain and will exceed all expectations. While our paella dishes and tapas are exquisite, we also help you create the perfect atmosphere. As guests enjoy our authentic paella in a communal dining setting, they come together and share in the excitement, making your event a joyous and warm occasion to be remembered for years to come. At Fire & Rice, we make the experience as easy as possible for you. We stock our food truck with everything you need to host a Fire & Rice party: We provide they plates, utensils, napkins and all the items required to cook and serve your guests. Just book your party, and we’ll take care of the rest! If you live in Southwest Florida and are interested in learning more about our Naples food truck, please call us at 239-269-8857 or click here to book your next party. We look forward to hearing from you!